Business growth is an indication that a business is surviving and succeeding. Business growth is a function of many factors, such a function of many management. Growth in business does not just happen; it is planned. All business, small or large, desire to grow. That's why Entrepreneurs or small business owners employ different strategies in order to grow their business. Business Growth Definition: When a business is growing, it means the business is achieving some measure of success. 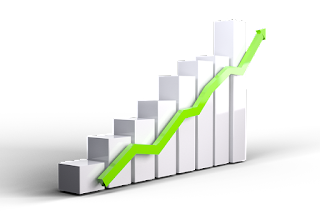 As mentioned above, business growth is an indication that a business is surviving. The growth of any business could be in terms of increase in sales volume profits, productivity and size. For influence power and survivability: Entrepreneurs grow their business in order to gain more power in the industry. To Employ and Retain Employees that are competent in doing their job: A business needs to grow in order to be able to employ, manage, and retain its employees. It's when a business grows that it can provide such opportunity. To meet customer's wide spreed demand for the firms products or services. To be a market leader: They need to grow in the world of business is to attain the status. Entrepreneurs want to become market leaders. Business owners adopt different strategies to grow. Internal business growth strategies are moves or action geared towards the growth of any firm within the business itself. External Business Growth Strategies: This involves establishing relationships with their parties. Strategic alliances and joint ventures. When a business grows, it needs also increase. Additional equipment to handle increased the workload might be required and existing personal might need to be trained. Also, it might require additional capital to meet its increased financial obligations. Another location might be needed as the current location might not be enough to accommodate increased businesses activities. All these must be looked into. These are the ways you can focus your time on business growth strategies to boost your productivity, and get 10x results from your marketing and that's why I called this an “X-rays into the world of business growth”. If you have any questions, opinion, regarding this topic or any online business ideas for beginners, please kindly drop your comment via the comment box below. Do have a pleasant day!